Maxwell: What's this? A new litter box? *snifff* With a new litter in it? Wait. 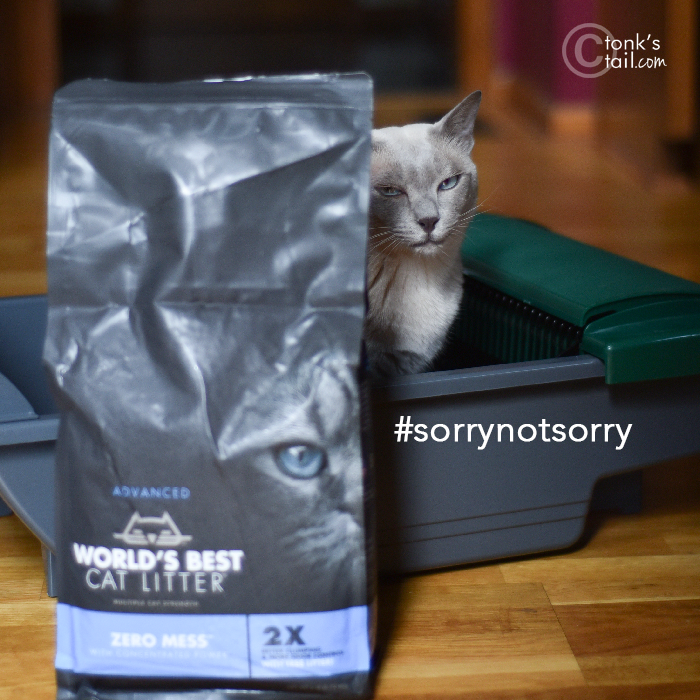 I thought we were loyal users of World's Best Cat Litter™... what happened? (why yes, this is a sponsored post - that ™ was a dead giveaway, right? Allie: PAWS OFF, Maxie. It's mine. And if you'd turn around, you'd see we are still using World's Best - it's just a new type. It's called Zero Mess™ and it guarantees fast and easy cleanup with two times better clumping and twice the odor control. And I repeat: PAWS OFF. This new litterbox is mine. Maxwell: Seriously, Allie? We've always shared - everything. Catnip, the scratchers, litterboxes. Allie: Yes, but a girl needs her privacy. A little space. A place to powder her nose away from your epic stink bombs, for goodness' sake! According to World's Best, this litter is purpose-built to make cleanup easier than ever before, and they claim it's a litter that promises no chiseling, no scraping and no crumbling. That's important right now at our house. Actually, the topic of litter in general is top of mind since Allie began to use our laundry room as her (expanded) litterbox a few weeks ago, leaving little puddles in extremely inappropriate places. I had to do a bit of sleuthing to catch her (honestly, I would have placed money on the culprit being one of the boys, not her!). I set up one of my Vimtag cameras in the laundry room and flushed her out (#litterboxpun) right away. The other Vimtag went voyeuristic: I set it under the stairs where I could observe the litterboxes and how they were being used. Long story short, after a trip to the vet to confirm no UTI issues and after some observation, it appears Allie is a bit anxious about sharing - and a bit more fastidious than we knew. A few very cat-savvy people suggested some supplements that would make her urinary pH a bit more comfortable (thanks, Aunt Connie!) ... and a separate automated litterbox just for her. 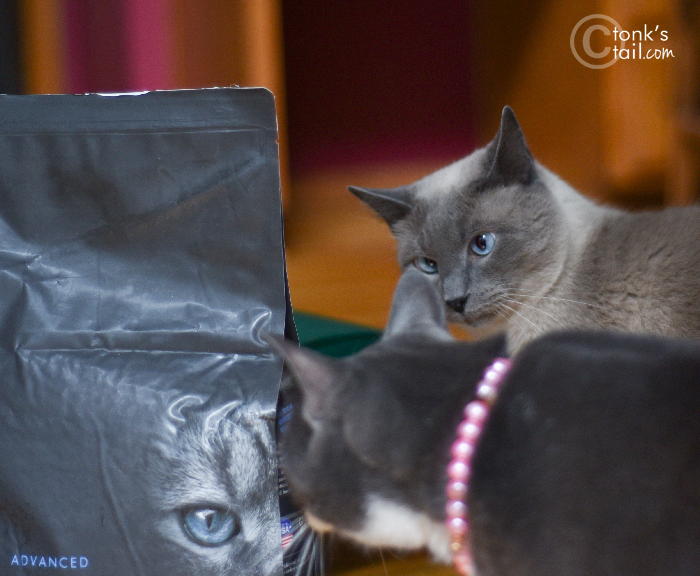 Then the invitation from World's Best Cat Litter to test drive their newest product showed up - at just the right time. 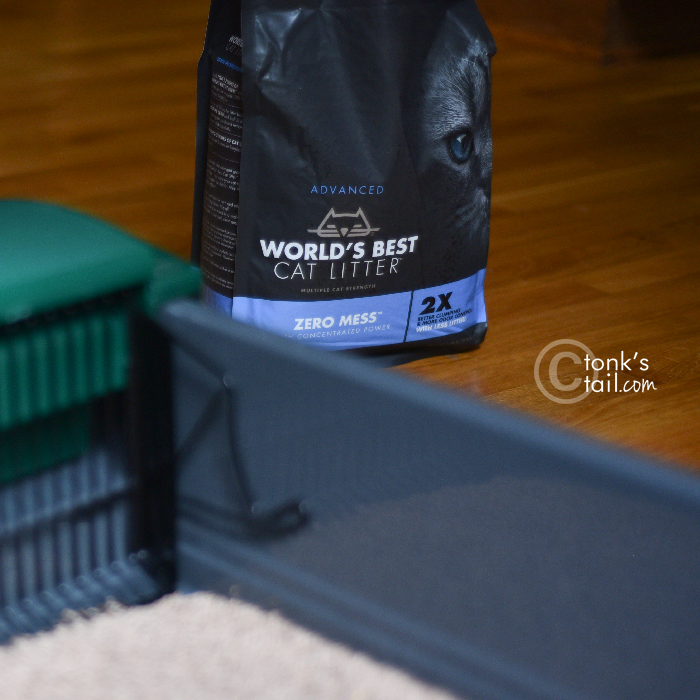 A litter that promises no chiseling, no scraping and no crumbling - plus easy cleanup - is just what a neat-freak girlcat like Allie needs right now. Allie gives this a pink manicured "paws up." It clumps firmly enough to make scooping easy, but not so firmly that it can't be flushed if you so desire. Let's digress for a brief moment to discuss that last point. I know some people prefer not to flush, and that's perfectly fine. This feature makes it incredibly convenient for cat owners. And I can only hope it makes litter scooping something people will be encouraged to do with increasing frequency (* see pet peeve at end of post). And it works beautifully in Allie's new automated box. Faraday: I can attest to that. Allie: *banshee shriek* GET OUT OF MY BOX! Odor control? In this house, it's mandatory. But please don't take our word for it. 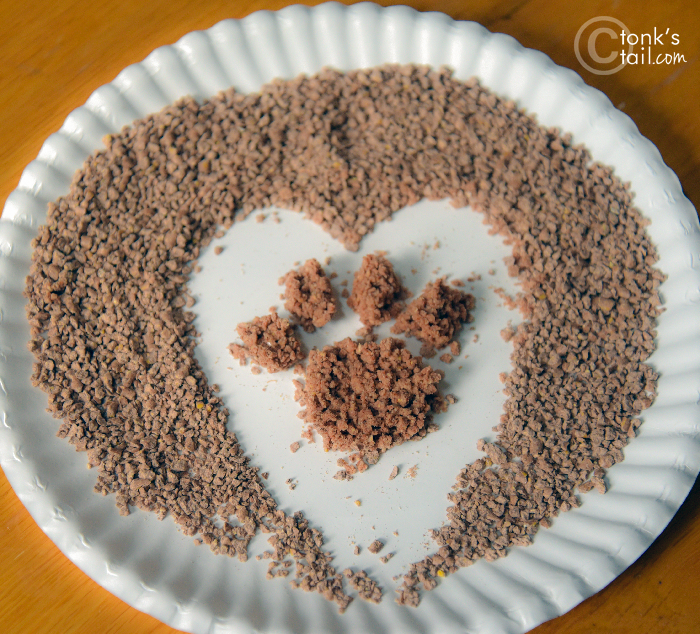 Check out World's Best Cat Litter for yourselves. You can find it at a store near you today! 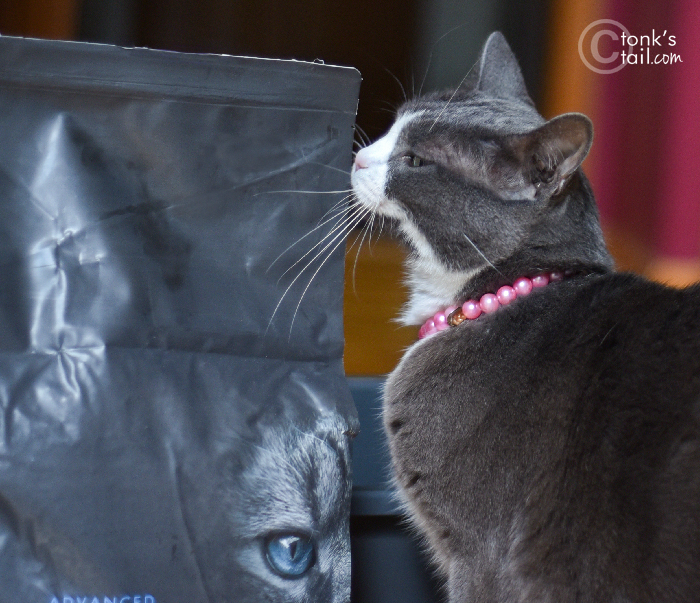 Like World's Best Cat Litter? 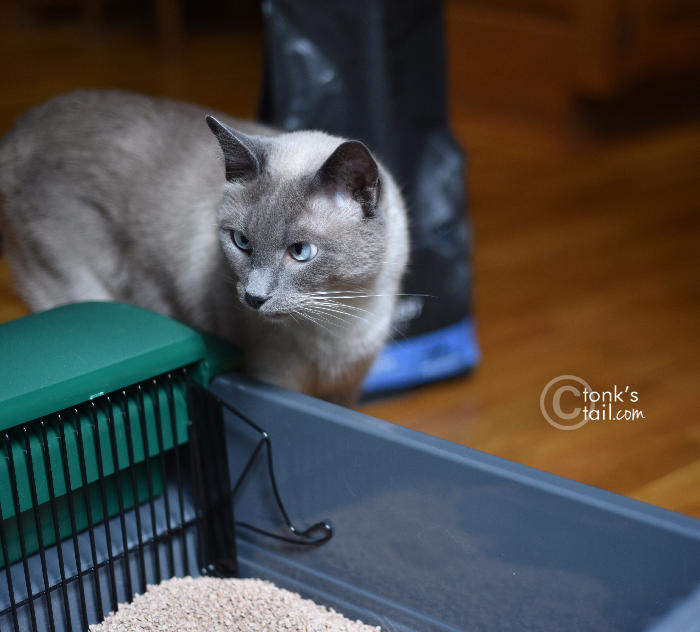 Improper litterbox use is one of the top reasons cats end up in shelters. Often it's due to the owner not properly maintaining the box and keeping it clean. If a flushable litter makes it more convenient for an owner to clean the box - and will do it more frequently - that's a big win in my book. A most informative and amusing post and we all thank you - including Äiti. Right now World's Best is not available in Finland (well it wasn't 2 years ago) as import is restricted as it uses GM stuffs - whatever that is. It's really annoying as Äiti thinks it is superb from her days in Britain. And flushable rocks rock. Paws crossed this helps Allie although it is quite right the mancats get to try it too.....surely ? California discourages flushing, but I'm sure it encourages regular scooping nevertheless! 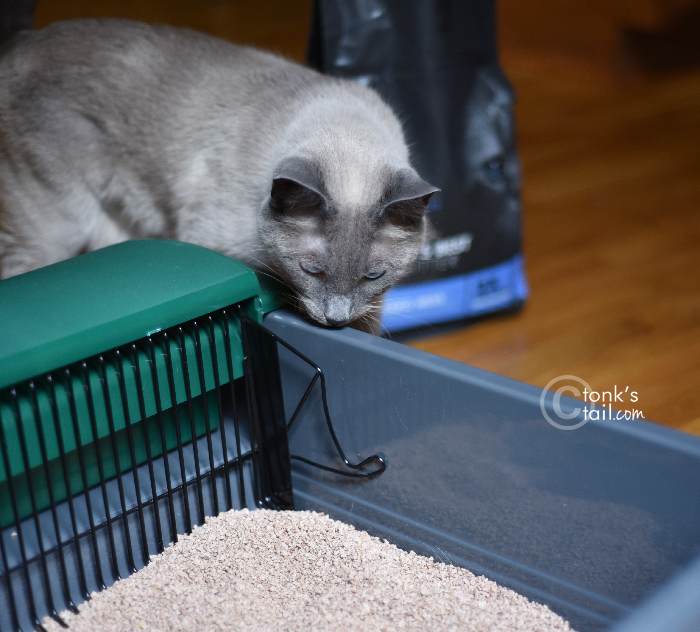 Paws crossed that the automatic litter box keeps things pristine enough for Allie! 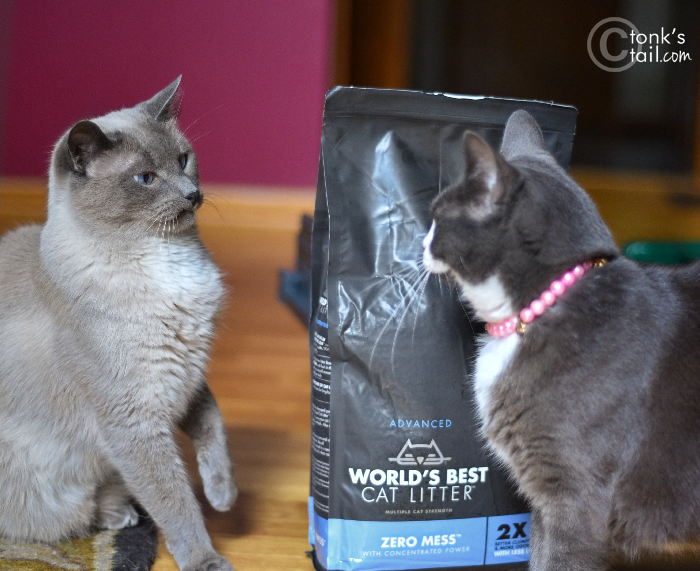 We have been using the new WBCL formula, and it works for everyone here, feline and human! Cats tend to manifest their insecurities via their bladders, so I'm glad that you now have your own litter box, Allie! As much as I would LOVE to change litter, I've learned the hard way that it's what the cats want, not the humans...and if they like the cheapo, clay litter, then I'll keep buying it until they aren't using it anymore. Allie, I'm so happy your wonderful human was able to figure out what was going on with you so quickly and found an easy solution to your problems. Pawsome post. We'll definitely be checking out this litter. Excellent review, pals! 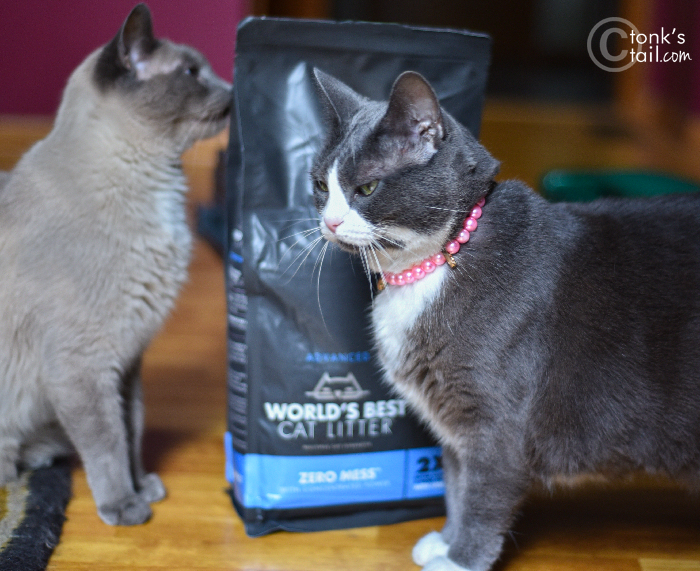 We are a World's Best Cat Litter household, too. We'll keep our eyes peeled for Zero Mess. We are glad you guys got things all straightened out, especially for Allie! Technology marches on... But TBT says he will not flush it. I hope it's the solution to Allie's little indiscretions. I used that brand until we had a bag hatch beetles. But it was a nice litter. You sure have a high tech bathroom! We have a different litter for our kitties and a basic bathroom. I guess you guys are pretty lucky to have the really good stuff! We use WBL ; we'll have to check and see if the new formula has arrived yet in Canada! Thanks for the head's up :) Allie, our Mama loves your pink, pearl necklace :) And she says, if you didn't have footage, she would never believe you were the laundryroom ""culprit"! :p Hope your mama is well and that you are all having a good summer thus far! Oh I hope Allie, that you feel more comfortable taking care of business now that you have your own special, automated depository. What a beautiful paw print sculpture you created! That could be the new logo fur World's Best Litter! Mom is trying me on a new litter right now, too. I am humoring her for the time being. Tee hee hee. We sure hope that new system works for Allie! 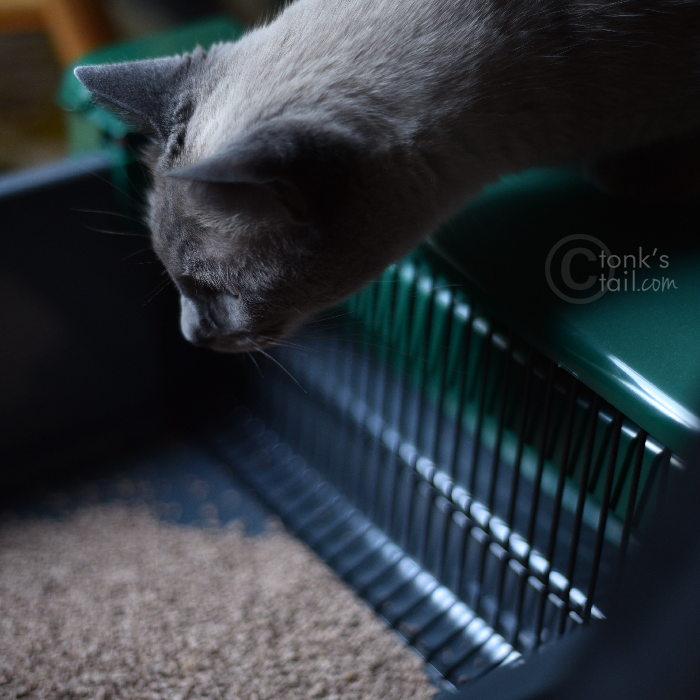 Just don't do what our angel Suki did way back when...we had a new automated litterbox...and she thought it was a blast...so much so that eventually she sat upon the rake, going for rides...in this case, curiosity killed the litter mechanism...MOL! I love that paw print! This is a really great litter. Will definitely pass on the word to my kitty friends!